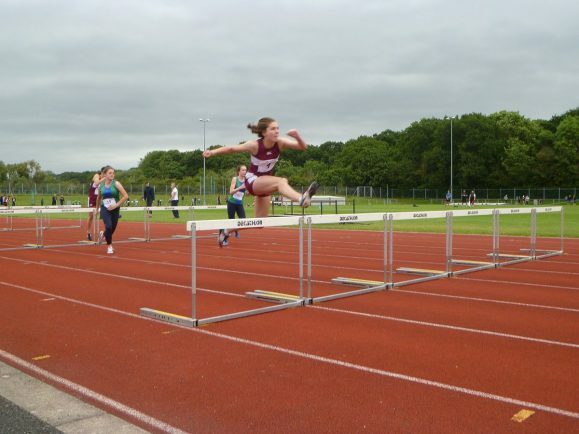 Olivia Corcoran of Bromsgrove School on her way to victory in the intermediate girls' 80m hurdles. COMPETITORS faced incredibly blustery conditions at the Hereford and Worcester County Schools’ Championships at Nunnery Wood in Worcester on Saturday. Runners had been selected to compete after going through school and district competitions. Those who performed well also have the potential to earn selection to the Mason Trophy (inter-counties competition) and then to represent H&W Schools in the forthcoming national competition (English Schools’ Athletic Association Championships). Both these events will be held at the Alexander Stadium in Birmingham. In the junior girls’ events Nikita Gotthardt-Mills (Ridgeway Academy, Redditch) finished first in both the 100m and 200m, fighting off Sarah-Jayne Ollis (The Chase, Malvern) in both races. There was just 0.1 seconds between them in the 100m and both were awarded the same time of 27.8s in the 200m. Lily Saxon (Alvechurch Middle School) convincingly won the 1,500m. There was a gold and silver medal for junior boy Sam Roberts (Bromsgrove School), winning the long jump and finishing second in the 80m hurdles. Sam Jones (North Bromsgrove High School) took two County Championship titles, winning gold in both the junior boys’ 100m and 200m. In the intermediate girls’ events Danielle Hopkins (The Chase, Malvern) placed first in the high jump in a new Hereford and Worcester County Championship record of 1.72m. She also won the long jump. Olivia Corcoran (Bromsgrove School) won the 80m hurdles and was second in the triple jump. Hope Bunn (Baxter College, Kidderminster) won gold in the 300m and silver in 200m and Deanna Clarke (Nunnery Wood, Worcester) won gold in the 300m hurdles and bronze in the long jump. The intermediate boys’ competition also saw a number of athletes leave with multiple medals. Kaisan Tulloch (John Masefield, Ledbury) became county champion in both long jump and triple jump. Stewart Greenhalgh (South Bromsgrove) won two silver medals in the long jump and 400m, just missing out to Josh Pearson (St Augustine’s, Redditch) in the latter, who took the gold. Chris Telling (King Charles, Kidderminster) won silvers in both discus and hammer. In the senior girls’ competition Liv Worth (South Bromsgrove) won gold in both the 400m and 800m. Meanwhile, Candy Lockett (Bromsgrove School) took first place in the hammer with a new record of 44.94m and also claimed silver medals in the shot put and discus. Back on the track, Brooke Clarke (Nunnery Wood, Worcester) won gold in the 200m and silver in the 100m. Hannah Tapley (Malvern St James) set a new record in the high jump by clearing 1.72m, whilst Rachel Baylis (The Chantry, Worcester) beat the old shot put record. In the senior boys’ competition Gareth Richardson (RSA Academy Arrow Vale, Redditch) won both the 800m and 3,000m races. Archie Freer (Bromsgrove School) placed first in both the hammer and shot put and James Milburn (Hereford Sixth Form College) won the discus competition and came second in the high jump. Harry Liversidge (Bromsgrove School) won the triple jump and came second in both the 100m hurdles and 200m, whilst Will Harman (St Augustine’s, Redditch) took gold in the long jump and silver in the triple jump. Georgy Muradov (Bromsgrove School) gained medals of all colours, coming first in the 400m, second in the 800m and third in the triple jump. Having set a new record last year as an intermediate, Joel Khan, from Tudor Grange Academy Worcester, cleared the high jump at 2.11m to beat the former senior boys’ record by a massive 11cm.